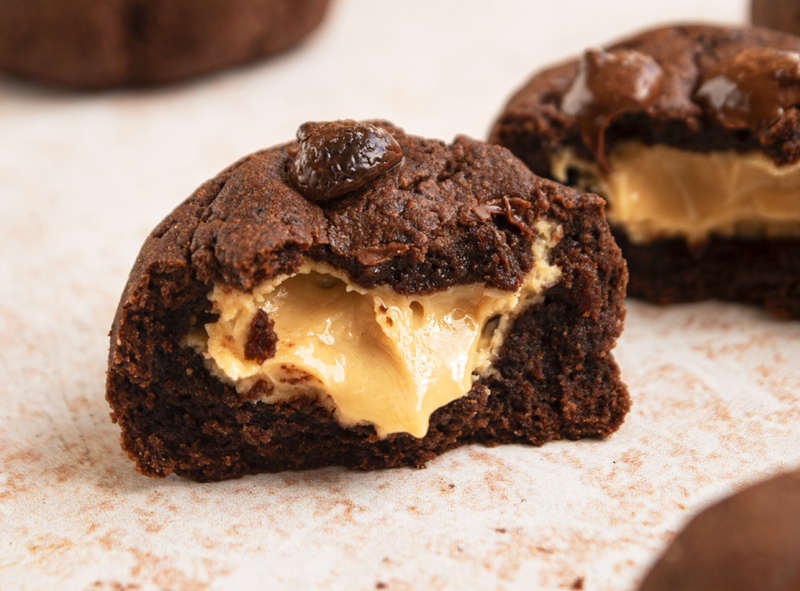 Oozing peanut butter encased in a fudgy chocolate cookie. Could there be a better combination? 1. First prepare the peanut butter center stuffing. Combine the peanut butter and coconut oil in a small bowl. Divide the mixture into 20 moulds – ice cube trays or chocolate moulds work perfectly (see notes, if you do not have molds)*. Then set in the freezer for 30 mins while you make the cookie mixture. 2. Preheat oven to 160C and line two large baking trays with baking paper. 3. Cream the butter, coconut sugar, Nuvia baking and peanut butter together with electric beaters until butter becomes light and fluffy. Add in vanilla and egg and beat until combined. 4. Sift flour, cacao and baking powder into butter mixture. Use a wooden spoon to fold the flour into the butter to form a soft dough. If the mixture is crumble mix in 1 tbsp. of milk at a time until mixture comes together as a smooth dough. 5. Divide the mixture into twenty balls of equal size. 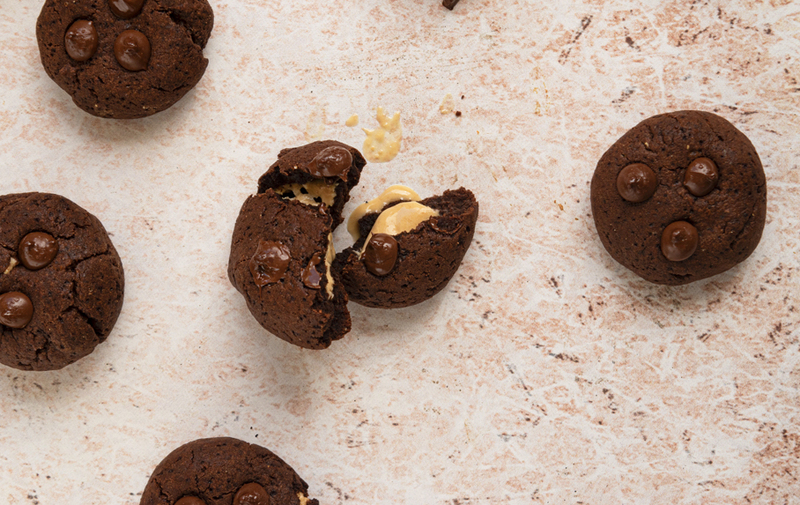 Using your hands, flatten a ball and then place a piece of the set peanut butter mixture into the center and fold the cookie dough around it to enclose it. 6. 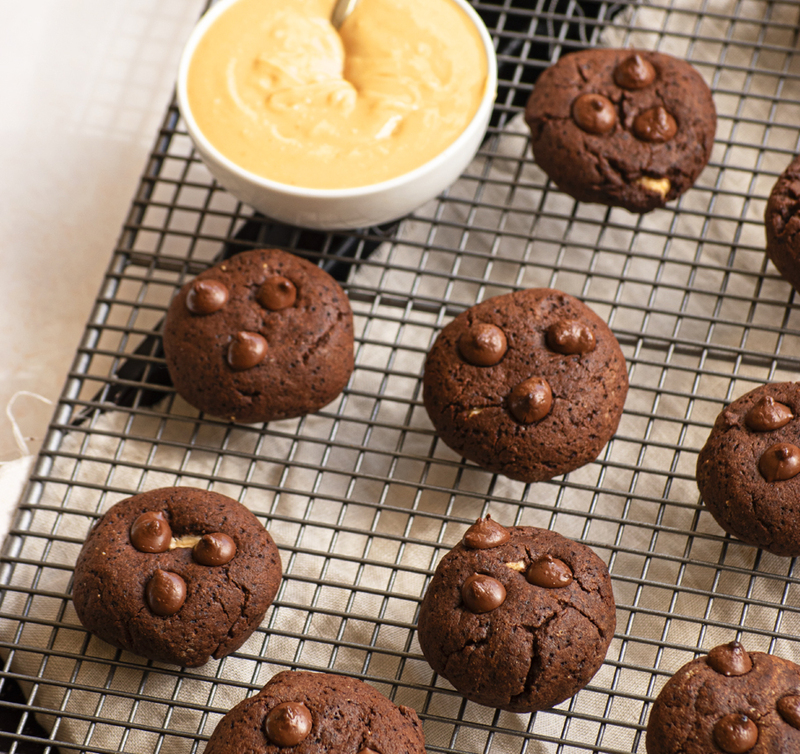 Place on the tray and put 3 choc chips on the top of the cookie. Repeat with remaining cookies. 7. Bake in the oven for 10-12 mins. Remove and allow to cool on a wire wrack. If you don’t have appropriate moulds for the peanut butter stuffing then place the bowl of peanut butter mixture into the freezer for 20 mins. Remove and scoop ½ tsp. of mixture into a mound onto a lined baking tray. Repeat with remaining mixture. Return to the freezer for 20 mins.